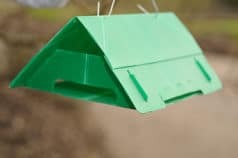 These traps are available in yellow and white coryx (plastic) with colour dependent on the target pest. This trap comes with a wire for suspension. The Delta traps are used in conjunction with white sticky liners and pherolures. Sticky liner is placed inside the Delta trap protecting it from dust and humidity while ensuring exceptionally long life and capture relability. This liner is covered in glue which is what traps the insects in immediate contact. Store in a cool and dry place. Away from direct sunlight.